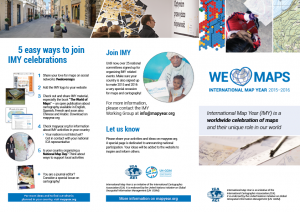 To help you put together fun and successful events for the International Map Year, we are providing a set of resources to promote your events. ICA grants you and your organization the copyright permission to use, copy, reproduce, and redistribute any or all of the IMY materials found on this website in support of your local IMY events and efforts. Please find all files and guidelines for the use of the IMY logo on the logo download page. Files marked as print pdf contain bleed and cropmarks. If you have ideas for further promotional material, please let us know. We are also happy to showcase the material you produced for your country. International Map Year (IMY) is a worldwide celebration of maps and their unique role in our world. 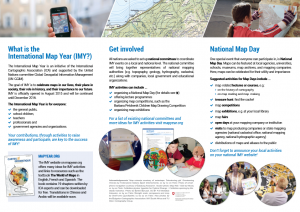 IMY provides opportunities to demonstrate, follow, and get involved in the art, science and technology of making and using maps and geographic information. Supported by the United Nations, IMY is an intensive international, interdisciplinary, scientific, and social strategy to focus on the importance of maps and geographic information in the world today. The most important legacies will be a new generation of cartographers and geographic information scientists, as well as an exceptional level of interest and participation from professionals, schoolchildren, the general public, and decision-makers, worldwide.